Cod is a type of cold-water fish found in the inshore regions and deep waters of both sides of the North Atlantic, according to the Encyclopedia Britannica. 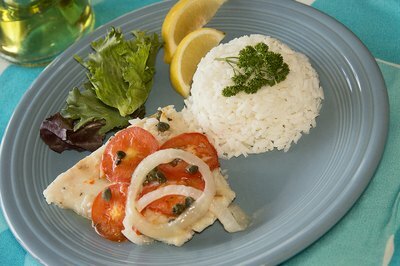 Cod is popular for its mild flavor and low fat content. It's also a great source of protein, omega-3 fatty acids, vitamin A, vitamin D and vitamin E. There are many ways to prepare cod fish based on your preference. You can greatly change the taste of cod just by experimenting with cooking methods and ingredients. Cod is a type of fish that's especially good for baking. There are many ways to make baked cod fish. Many people looking for healthy ways of preparing cod choose to bake it in the oven with low-fat ingredients. Regardless of how you choose to bake your cod, you should start with about 1 to 2 lbs. of cod fillets. Wash the cod thoroughly and remove all skin and bones. Place the cod on a large flat plate or tray and dry them with paper towels to remove excess water. Preheat your oven to 375 degrees while you prep the cod. Coat the bottom of a glass baking dish with about 2 tbsp. of margarine, butter or extra virgin olive oil. Place the cod, skin side down, in the baking dish. Thinly slice 4 whole tomatoes and place them on the fish. Season the cod fish with 1 tsp. of kosher salt, 1/4 tsp. of ground black pepper and 1 tbsp. each of minced shallots, minced garlic and chopped parsley. Finally, pour 2 tbsp. of lemon juice and 1/4 cup of extra virgin olive oil over the cod fish. Place the cod fish into the oven for about 20 to 25 minutes. You'll know the fish is done when the ingredients on top of the fish are crispy and the fish flakes when touched. Remove the cod fish from the oven and allow it to cool before serving. 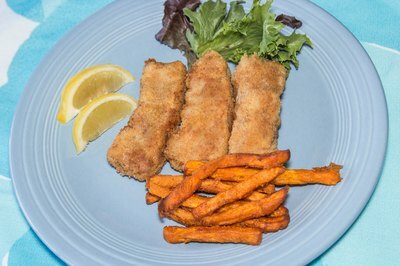 Try pan frying cod fillets for a crispier tasting fish. Start with about 1 to 2 lbs. of cod fillets. Wash the cod thoroughly and remove all skin and bones. 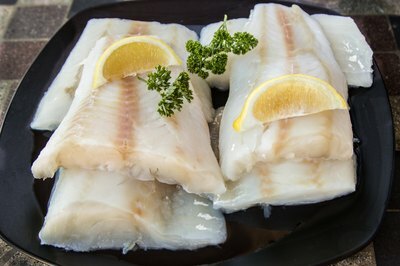 Place the cod on a large flat plate or tray and dry them with paper towels to remove excess water. Cut each cod fillet into strips about 1 1/2 inches wide. Season the cod fish with about 1 tsp. of kosher salt and 1/2 tsp. of ground black pepper and set aside. Crack 2 eggs into a shallow bowl. Use a fork or wire wisk to thoroughly beat the eggs. Place the strips of cod fish into the egg batter. Move the fish around in the batter to assure that each strip is completely covered with egg batter. Pour a generous amount of plain bread crumbs into a separate shallow bowl. Use a fork to remove the strips of cod fish from the egg batter, shaking off any excess batter. Place the fish into the bread crumbs. Make sure each piece of cod fish is covered completely with the bread crumbs and set aside. Pour about 2 to 4 oz. of your favorite cooking oil into a large skillet. Heat your cooking oil over medium to high heat. Once the oil is hot, add a few strips of the cod to the skillet. Fry the cod for about 5 minutes on each side until golden brown. Remove the pieces of fish from the pan and place them on a plate covered with paper towel to cool. The paper towel helps to drain the excess oil. Place the next batch of fish into the pan. Repeat the process until all cod fish pieces are cooked. Serve fried cod with french fries or sliced oven-fried potatoes to create a fish-and-chips dish.